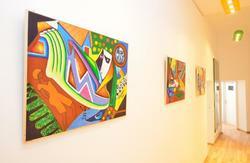 The Art-Hostel Berlin City is situated in a beautiful building which is more than hundred years old. The house has been carefully restored after the reunification without destroying its character. 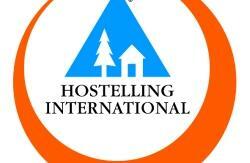 In August 2014 we open the only German Art-Hostel. 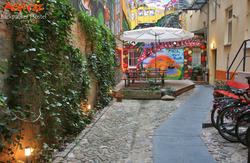 Art-Hostel Berlin City is very centrally located in Friedrichshain, the most visited district of Berlin. We are only 5 min away from the worldwide known 'Eastside Gallery', only 3 min. from the famous 'Berghain' club, some minutes away from restaurants, bars, clubs, theaters and a lot of other places which are worth a visit. By public transport you can reach everything in Berlin very easily - for example 'Museums Island', shopping malls. The city of Potsdam with its palaces (all in the UNESCO world heritage program), too. You'll find unique rooms with a different theme, modern bathrooms, a cozy common-room for meeting people, listening to little concerts, workshops, readings, twice a month to an improvisation theatre group and a lot more. Taste our self-made snacks, have a coffee/tea and feel like being in a family. Payment upon arrival by cash, debit cards, PayPal. Please contact us before if you have a late arrival after 23:00. Take the S-Bahn S5, S7, S75 or underground U1 to 'Warschauer StraÃŸe'. Coming out of the station turn right, cross the street and go into the first street to the left side. Switch to the (next) street right: 'MarchlewskistraÃŸe'. YouÂ´ll find us in No.88 (on the left hand). You can reach us from the train station 'Ostbahnhof' directly with Bus 347 ('Helsingforser Platz'). There go back into 'MarchlewskistraÃŸe'. Trams (M10/M13) are around the corner - taxis, too.